We have a very special set of four Johansson and Soner dining chairs (see original makers stamp in photos). We could talk endlessly about these beauties, but really the pictures do all the talking for us. The incredible boomerang leg base is very reminiscent of the Hans Wegner CH29 chair. 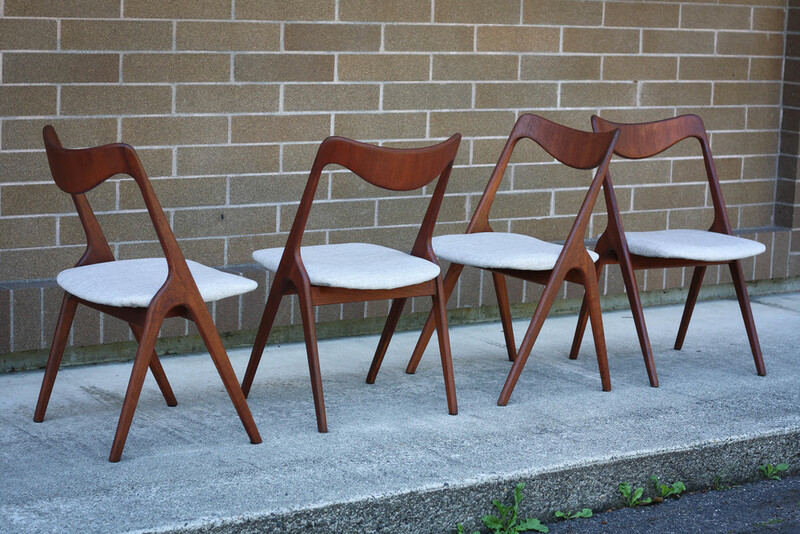 The back is very similar to the Moller #75 chairs. Basically you get two of the most coveted chair designs packed in to one chair. The seats are upholstered in a heather gray linen/polyester blend. The soft feel and texture of linen, with the stain resistance and pet/child friendly nature of synthetic fabric. As to be expected with any true mid century piece of furniture, each chair will have minor markings or imperfections, but nothing that distracts from the chairs gorgeous aesthetic.